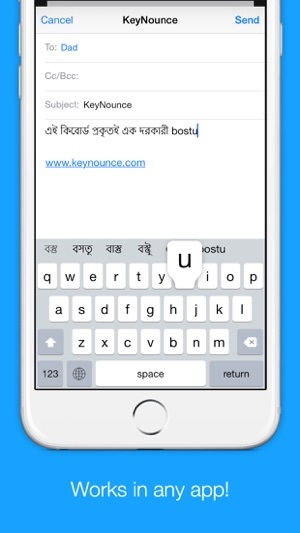 KeyNounce is the easiest way to type in Bangla/Bengali using just the English keyboard. 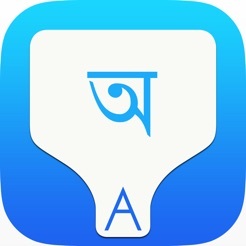 KeyNounce uses a technique called "transliteration" that enables you to type the Bengali pronunciation in English, instantly giving you back the word written in Bengali. 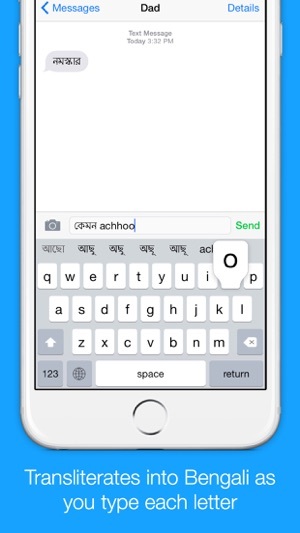 For example, typing "shagotom" will be converted into the Bengali letters right as you type! It’s simple, fast and super accurate. You don’t need to worry about typing in the exact English spelling for an Bengali word, KeyNounce is smart enough to accept many input spellings for the same output word. If you can write, or read Bengali, but aren’t used to typing using the Bengali keyboard, KeyNounce is the perfect solution for you. KeyNounce works in any app! 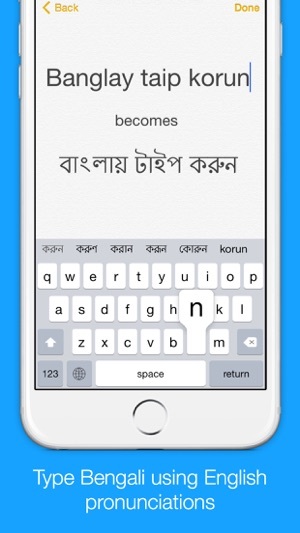 Once you enable the keyboard you’ll be able to easily compose texts, emails, tweets, facebook posts, and search the web in Bengali. Great keyboard but could be more polished. Some trial users rated this app low, not based on how the app works rather based on the price they have to pay. To me, developer deserves better rating for the work he did. Keyboard works flawlessly. Though I was looking for a dark skin version of the keyboard, switching between English to Bangla needs to get easier. I also think the price could be less for everyone so that users can afford to buy it but shouldn't be completely free as developer deserves to get paid for his good works. I gave the app 4 star because there is always room to do better. Thank you. 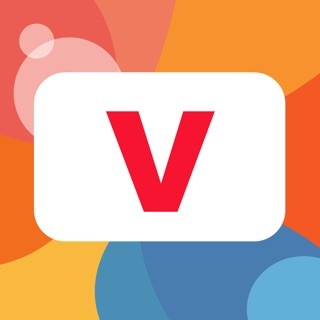 This is an awesome app. Don't know why it needs full access though. However, instead of reviewing the app, I'm gonna review those of you who rated this app poor because the app is not free. Not only that can't be a reason to rate this app poor, you guys should be shameful for asking everything for free. Get a life guys. The developers of this app need to survive as well. Do you work for free? Then why would you expect them to deliver something to you for free? We the Bangalees want everything for free.... such a shame. I was so very happy with this app that I overcame all the obstacles (you know USA credit card etc) to purchase this and was happily using this and would give 5 star until recently I’m facing a problem. 1. There is no full stop sign that has been asking for ages and sadly no feedback from the developer yet. 2. Recently when trying to type in Facebook app, last few typed letters remain invisible from screen. That’s why can not type or edit properly. Not sure if the developer will notice my comment or not but it’s really important to fix this bug.